Location: Lanuéjols, in the Lozere departement of France (Languedoc-Roussillon Region). Ownership / Access: Owned by an association. 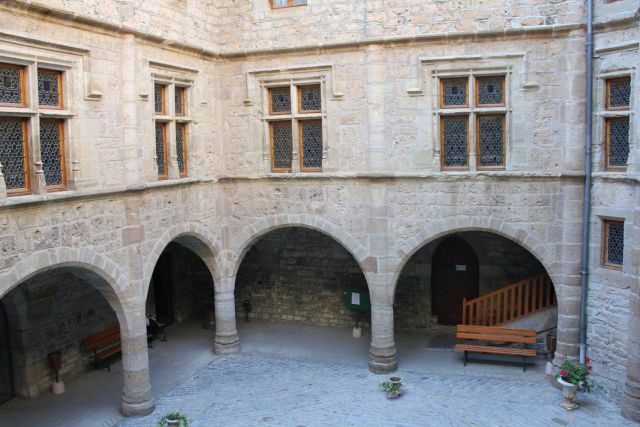 Notes: Château du Boy is a castle located in Lanuéjols Lozère. Former property barons of Tournel, it has since been converted into several uses and is currently an alcoholic after-care center.The barony of Tournel, one eight baronies of Gevaudan had his possessions across the high Lot valley and on the Valdonnez. Their main castle before the fourteenth century castle of Tournel. Their barony is broken down into five commandments: Tournel, Chapieu, Montialoux, Montmirat and Montfort. Near Lanuéjols, which will become the castle Boy, is, in the fourteenth century, a large farm, named mas del mansus or Boy. The term Boy is similar to that of "drover". The farmhouse is quoted as 1294. 1307 to the family of Tournel decides to leave his castle defense, preferring the comfort of the castle Boy. In 1369 the castle was improved and strengthened. Road indeed threaten the region.